HOV lanes are available in the Hartford area on Interstate 384, Interstate 84 (east of Hartford), and Interstate 91 (north of Hartford). Often during peak commuter hours, mainline traffic on Interstates 84 and 91 is very heavy and congested. Traffic on the HOV lanes, on the other hand, usually moves at free-flow speed during peak hours, providing time savings for people who carpool, vanpool, and use transit. 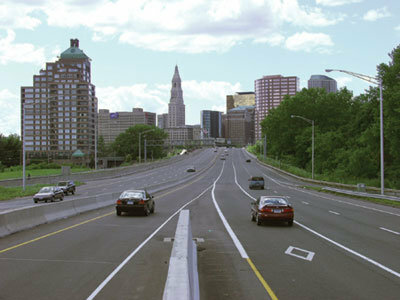 The HOV lanes along I-84, however, were an incomplete system that did not serve commuter travel into downtown Hartford efficiently. 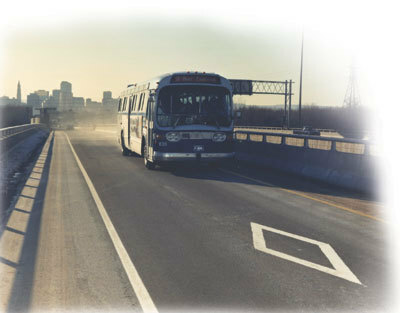 Opened in 1989, the I-84 HOV lanes started in Vernon to the east and terminated in East Hartford about 1.5 miles short of the Founders Bridge into Hartford. Carpoolers, vanpoolers, and bus riders had to merge back into mainstream traffic and drive six more exits before reaching downtown Hartford. That segment of freeway into downtown Hartford had congested traffic levels, operating at Level of Service "F," indicating severe traffic delays, with an average speed of only 9.4 miles per hour during the morning peak hour period. This congestion made commutes downtown slow for even those who chose to rideshare. This project involved extending HOV lanes on I-84 by 1.5 miles to downtown Hartford. Work began on the extension in the summer of 1999; the extension opened for service in June 2001. The new lanes extend to the Founders Bridge, enabling carpoolers destined for the downtown area to use the lanes all the way into Hartford. Only those HOV users crossing the Bulkeley Bridge to destinations farther west continue to merge with westbound main-line traffic. In addition, the I-84 HOV lanes were restriped to facilitate more flexible operation. Eastbound travelers now can enter the lanes from I-84 or Route 15, allowing carpoolers the option of using the HOV lane if the mainline becomes congested. The restriping also gives eastbound users of the Charter Oak Bridge the opportunity to enter the HOV lane. By increasing speeds for carpoolers and transit traveling into Hartford, the project improvements have enhanced the attractiveness of ridesharing to work. According to a traffic count study conducted annually by the Connecticut Department of Transportation, in the first year of operation, the improvements resulted in a 25-percent increase in HOV lane usage during the peak hour and a 34-percent increase in usage during the overall peak period. The use of the HOV lane translates into a more efficient highway system, and recently completed counts show that the I-84 westbound HOV lane is effective. Between 6 a.m. and 9 a.m. on an average day in September 2002, 1,095 vehicles carrying 3,660 people traveled in the HOV lane, compared to an average of just over one person per vehicle in the general-purpose lanes. Drivers head west in the HOV lane from East Hartford toward the Founders Bridge. 21"HOV Lane Extension Provides Tremendous Benefit to Commuters." The Commuters Register, Connecticut, December 2002, page 23.